Just in time for Valentine's Day, Diptyque has introduced a limited edition capsule collection: Rosaviola, a scent packaged in collaboration with designer Olympia Le-Tan. I'm not specially a fan of Le-Tan, whom The New York Times has praised for her "glamorous geek aesthetic" and her clutch purses that reinterpret classic book covers in fabric and embroidery — a "nod to a bygone era when people carried actual books," the Times tells us.1 I still carry real books, rather than a $2000 clutch, but I'm not one of the well-connected Le-Tan's celebrity clients and never will be. What I am, however, is someone who can not resist a violet-rose perfume, so here we are. 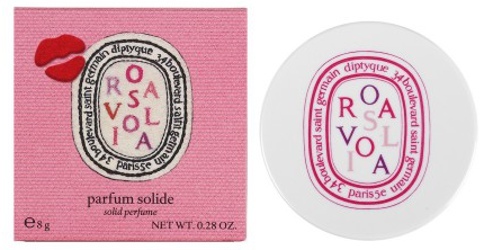 In Rosaviola, you get just what Diptyque promises: a very powdery violet, a quick pop of red berry and some dewy pink rose petals. There's a refined leather note that makes an early appearance, and just enough soft musk to act as a base of sorts, but Rosaviola is a fairly linear scent. It really does suggest the interior of a woman's purse, especially if that woman happens to carry a pack of Choward's Violet Mints with her at all times. In this solid format (which melts right into the skin, incidentally), Rosaviola doesn't last more than two to three hours on my skin, but it's fun to reapply with the touch of a finger. It feels frivolously retro, and it sticks to its theme; it doesn't take itself too seriously. While I'm not wild about Olympia Le-Tan's work in general, she does seem to be a longtime lipstick-lover — in 2013 she collaborated with Lancôme on deluxe packaging for the cosmetic giant's Rouge in Love collection, and she often mentions red lipstick as one of her style essentials.3 She's a good fit for this capsule collection, which happens to be a perfect gift idea for Valentine's Day. If I hadn't already treated myself to this solid perfume, I'd put it (and the candles!) on my wishlist. Diptyque + Olympia Le-Tan Rosaviola is available in an 8g solid perfume ($50) as well as 70 and 190g candles and a scented ceramic home-fragrance disk. The collection is limited edition. For purchasing information, see the listing for Diptyque under Perfume Houses. 1. "Like Father, Like Daughter," The New York Times T Magazine, February 15, 2013. 2. The Surprising French Girl Secret to an Alluring Signature Perfume," Vogue.com, January 17, 2016. 3. "Olympia le-Tan and the world's coolest book club," The Independent, February 10, 2013. The candle is a great alternative if you like the *smell* of violet candies and face powder but you don’t actually want to *wear* that smell! Well, as you might just know, Lipstick Rose is one of my “holy grail” perfumes! So I won’t argue with you there. Lipstick and leather would be a great combo. This one does not sound very bold with the leather though. I’m guessing that it is no Jolie Madame. Any other lipstick fragrances that add leather, do you know? ‘ … era when people carried actual books.’ Pshaw! I’m usually not a huge lipstick-scent lover, but I must admit being tempted by the candles. And while I totally got your sarcasm, I believe there is something of a trend going on and that’s always fascinating to watch (and sometimes even participate in!). There does seem to be a rose mini-revival every spring, but the lipstick trend is something new this year. Funny, how everyone jumps on the bandwagon at once! and even funnier, how there’s an ongoing assumption that we like or need the “French women/French girl” imprimatur on things. I happened to be at a Nordstrom yesterday that carries Diptyque and both of the frag dept’s salespeople were pushing Eau Duelle on me, which I found odd (since it’s not a new release or anything?) There was also a big Rosaviola display and I’m now wishing they’d suggested I try this one instead. I love violet anything, and violets and leather in particular. The display seemed to be the hangout spot for all the cosmetics dept SAs so I avoided getting anywhere near it. Next time I’ll push my way through! That’s funny! I like Eau Duelle enough, but it’s certainly not new. Maybe it’s been doing well because it’s vanilla-heavy? But yes, do go back and try Rosaviola if you have a chance! It’s a cuter little cousin to Putain des Palaces by Etat Libre d’Orange. Looks like my wishlist just got a little longer! Now that you mention it…! Well, the lip balm goes on the mouth, so I *am* a little bit skeeved by that, but the solid perfume just goes on my wrist and neck, so there isn’t much chance for me to ingest any germs! and I think the thing to remember with solid perfumes is to enjoy them and use them avidly before they dry up and lose their scent — a scarier risk! Lovely review Jessica, i too guffawed at reading about ‘still’ carrying books! I’m hoping for a full bottle of Iris Poudre for valentines day..but the candles are so tempting! I’ve just read the review of Florabellio, which sounds like something i’d like for the summer months. I also love L’ombre dans l’eau, and philosykos is on my summer ‘if a good offer comes up on ebay’ list! If you have Lipstick Rose and Iris Poudre in your “wardrobe,” you won’t need much else for a while! I’m still enjoying Florabellio, and I’ve been wearing L’Ombre dans L’Eau every summer since…2003? !…so obviously that’s one of my all-time favorites! It never fails me. 12 years is definitely true love! L’ombre dans l’eau remind’s me so much of yves saint laurent ‘In love Again’ which i wore as a teenager, my mum gave me an unwanted bottle from a boyfriend in the early ’90’s, i felt so grown up and sophisticated wearing it, but it was also a very joyful scent. When i first smelt LODL it really transported me back. I’d love to compare them, but prices are quite steep on ebay now, and it’s easier to have something a little different to what u used to wear, i think. Well this post made me want to try it, so while everyone else is buying food like it’s the end of the world at the Whole Foods at Columbus Circle, I ventured into the Dyptique Boutique and tried it. I didn’t get much fragrance inside, but the moment I went outside in the cold- Blammo! It came alive. Well maybe not so dramatically, but I loved it. Certain scents work better on me in the winter- like the vintage – ones- Cinema, L’instant, etc. Now that I’m inside, it’s faded, but I didn’t try a lot. And what I did try was on my hand. It definitely piqued my curiosity. I got alot of violet, and not alot of rose. It also didn’t feel lipsticky, but more spicy. This post really makes me want to try it also. Hoping and crossing my fingers that my Nordstom’s gets this in. It’s sold out on line.